Please ignore the many diversions in this image: the saucered floor of Ptolemeaus, Davy’s unique crater chain (due to a breakup of a comet ala Shoemaker-Levy 9), the rilles and dark halo craters of Alphonsus, Alpetragius’ hemispherical central peak, and the faulted rille on the floor of Arzachel. Focus instead on perhaps the longest straight line on the Moon - the 225 km long alignment of elongated flat-floored depressions running roughly north-south between Ptolemaeus and Davy. The lineament is also defined by some elongated mounds and the sides of some of the depressions are raised. The American geologist Grove Karl Gilbert in 1893 was the first to point out that there is a family of linear features such as this and that they are radial to Imbrium. Gilbert considered Imbrium to be a gigantic impact crater filled with mare lavas, and that the Imbrium Sculpture (as he termed the radial features) were associated with the formation of the Imbrium crater. He was exactly right! Most individual alignments of the Imbrium Sculpture have not received designations, so for convenience I am calling the the feature described here the Alphonsus Line since that is where it stops. 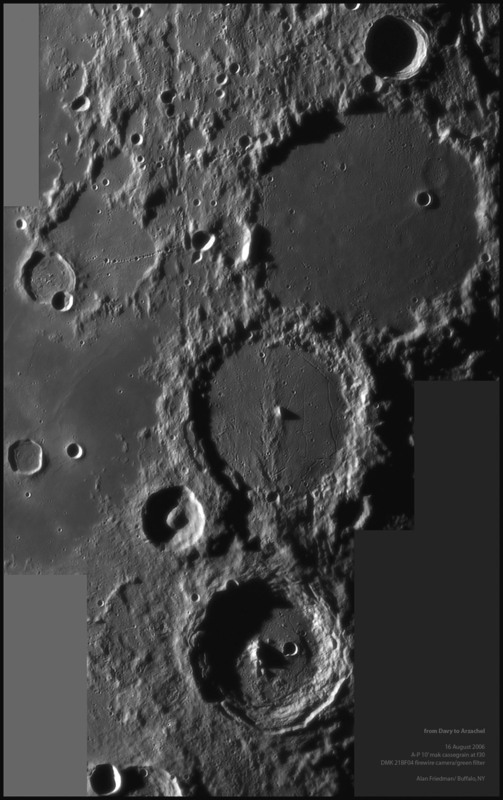 Various researchers have proposed that Imbrium Sculpture lines are gouges, but the Alphonsus Line and others are not continuous and in some places it appears that the linear depressions are coalescing craters. In fact, some basin linears such as the Snellius and Rheita valleys are overlapping secondary craters from basin formation - in those cases, the Nectaris Basin. Another example of basin radial sculpture is the Alpine Valley which is quite likely to be a structural feature - i.e. a place where the ground fractured apart. These examples demonstrate that the Imbrium Sculpture is formed by various processes - just as you might expect from a complex and catastrophic explosion affecting trillions of tons of rock. Aug 16, 2006. 10″ mak/cass at f30 with a DMK21BF04 mosaic of 10 images; approximately 100 frames stacked per segment - captured in Astro IIDC and processed in Adobe Photoshop CS2 on a Mac platform. Christmas is coming - consider leaving a list of lunar books on top of a spouse’s pillow - just make sure you include the LPOD URL so that you support LPOD when buying lunar books (or ANY book) from Amazon! There have been 2212 visitors to this page.